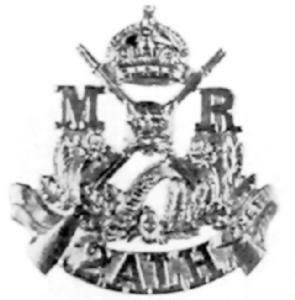 The regiment continued as the 2nd until 1912, when, in the reorganisation of that year it became the 9th Light Horse (New South Wales Mounted Rifles). It saw a further change in 1918 when it was styled 6th Light Horse (New South Wales Mounted Rifles). The sister regiment, 5th Australian Light Horse, maintained the territorial name until completely breaking away and taking on the territorial title "Northern River Lancers" in 1907. Major HB Lassetter, 12 April 1889. Captain HGB Sparrow, 26 October 1887. Captain CHE Chauvel, 26 September 1888. Lieutenant CAC Chauvel, 26 September 1888. Second Lieutenant TH Tennant, 10 April 1889. Captain AS Menzies, 19 October 1888. Second Lieutenant CM Donnelly, 10 April 1889. Second Lieutenant NH Macdonald, 10 April 1889. Captain WL Moore, 23 October 1888. Second Lieutenant GB Newman, 30 January 1886. Captain F Bland, 23 October 1888. Lieutenant AW Row, 3 June 1889. Second Lieutenant AEI Given, 3 June 1889. Captain G Tompsitt, 6 November 1888. Lieutenant HJ Dixie, 6 November 1888. Captain JM Antill, 19 January 1889. Lieutenant DBM Clark, 7 March 1889. Second Lieutenant F Butler, 7 March 1889. Lieutenant NH Macdonald, 8 July 1890. Second Lieutenant FV Wikner, 25 March 1890. Lieutenant GB Newman, 19 March 1890. Second Lieutenant SG Fenton, 19 March 1890. Second Lieutenant J Dunlop, 27 May 1890. Second Lieutenant G Bradbury, 14 May 1893. Lieutenant NH Macdonald, 6 July 1890. Lieutenant J Newman, 18 June 1892. Second Lieutenant W Larkin, 22 September 1891. Number 3, Bega - Queanbeyan Company. Captain Commanding, F Bland, 23 October 1888. Number 3, Bega Half Company. Lieutenant JM Lee, 2 April 1892. Number 3, Queanbeyan Half Company. Captain HJ Dixie, 9 February 1892. Second Lieutenant WD Downing, 23 February 1892. Number 4, Tenterfield - Inverell Company. Captain Commanding, Captain CHE Chauvel, 26 September 1888. Number 4, Tenterfield Half Company. Second Lieutenant JF Thomas, 4 February 1891. Number 4, Inverell Half Company. Lieutenant CM Donnelly, 23 July 1891. Second Lieutenant WC Hanwell-Allen, 29 June 1891.